A woman has died after being hit by a car in Derbyshire. 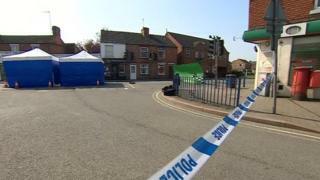 The victim was pronounced dead at the scene on Derby Road in Sandiacre at about 09:10 BST. Derbyshire Police said an earlier appeal had traced a car seen in the area at the time and the driver was now assisting officers. They also asked anyone with dashcam footage from the time of the crash to come forward. Road closures in the area have been lifted. The woman's family has been informed.